Indian fry bread is the foundation of a popular dish called Indian Tacos. Originally known as Navajo Tacos, they have been adopted by other tribes. The Navajo taco was voted the State Dish of Arizona in a 1995 poll conducted by the Arizona Republic newspaper. Indian tacos, made with Indian fry bread, are the universal modern powwow food (see below). They are also popular attractions at many fairs, festivals, and outdoor summer shows held in the southwest. People will line up to wait their turn to buy some freshly made tacos. 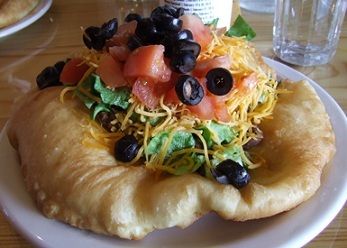 Indian tacos are a combination of beans or ground beef, chopped lettuce, sliced tomato, shredded Cheddar cheese, and optional green chile atop plate-sized rounds of crispy Navajo or Indian fry bread. No plates or silverware are need, as you just fill the fry bread with your desired filling, roll it up, and eat. Photos courtesy of the National Indian Taco Championship held in Pawhuska, Oklahoma. The Navajo planters lived from the Earth as their ancestors had for hundreds of years before. They also raised livestock to feed their family. The Navajo dinetah (or homeland) was bordered by the four sacred mountains, from northeastern Arizona, western New Mexico, and north into Utah and Colorado. They planted crops in the fertile valley lands, such as Canyon de Chelly known for Ansazi ruins. The Navajo traded with the Spanish, Mexican, Pueblos, Apache, Comanche, and even the early American pioneers. Around 1846, large numbers of pioneers moved into the area and the cavalry came with them. This is when troubles began. The troubles escalated with the murder or Narbona (1766-1849), a well-respected Navajo leader on August 31, 1849. On this day, Narbona along with several hundred of his warriors, had come to meet and discuss peace with U.S. Colonel John M. Washington and others of the military stationed in the area. There had been trouble with theNew Men (the New Mexican settlers who had driven Mexican settlers out of the area). After several hours, it was believed a settlement had been agreed upon. However, a young warrior by the name of Sadoval, had plans of his own. Mounting his horse he began to ride in front of the Navajo party, attempting to have them break the treaty. A U.S. Calvary soldier began to say that one of the horses ridden by a Navajo was his, and what peace there was in the meeting that was disintegrating into battle. Colonel Washington commanded the Navajo to stand down and return the horse to the soldier or he would fire into them. The rider and horse were now gone, and the Navajo party did not comply. A canon was fired, and Narbona was mortally wounded. It is told that he was scalped by a U.S. soldier as he lay dying. This disastrous attempt at peace led to the Long Walks. In September 1863, Kit Carson (1809-1868) was dispatched into Navajo land to retrieve a surrender. When no Navajo came to meet with him, he ordered the burning of the land. Attempts were made to starve out the Navajo and many were captured and taken to Bosque Redondo near Fort Sumner. Hundreds starved on the 300 mile walk and more would die later in the crowded and disparaging conditions . Navajo were placed with the Mescalero Apache where home peace was often not the case. The camps were meant for 4,000 to 5,000 people, yet there were now over 9,000 people, and supplies were meager. To some, Indian Fry Bread is a sacred tradition. It is to be consumed by the people until the earth has again become purified. Wherever one finds Indian fry bread one finds its taco equivalent, and curiously enough, it’s often named after whichever tribe the reservation belongs to. 1993 – The American Indian Exposition in Anadarko, Oklahoma hosted its first National Fry Bread Contest. The purpose of this exposition is to show off Native American arts and crafts and help preserve their cultural heritage. This event also features one of the largest American Indian parades in Oklahoma. 2005 – South Dakota designated fry bread as the Official State Bread with House Bill Number 1205 on February 25, 2005. 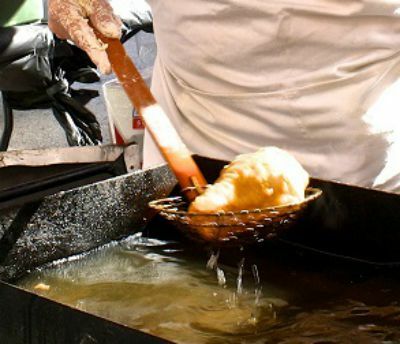 Present Day – Today, fry bread is generally known as a Carnival or State Fair treat to the general public. In some areas of the United States, this sweet treat is known as Elephant Ears. It is a quick bread that’s fried and served as a sweet treat, drizzled with honey and sprinkled with cinnamon sugar. Fry bread is most often used as the foundation of the famous “Indian Taco with ground beef and other taco ingredients of your choice. The National Indian Taco Championship is a festival held in Pawhuska, Oklahoma on the first Saturday in October. Sift together the flour, salt, powdered milk, and baking powder into a large bowl. Pour the water over the flour mixture all at once and stir the dough with a fork until it starts to form one big clump. In a deep heavy pot, heat the vegetable oil to about 350 degrees F. You can check if you oil is hot enough by either dropping a small piece of dough in the hot oil and seeing if it begins to fry, or by dipping the end of a wooden spoon in and seeing if that bubbles. Your oil should be about 1-inch deep in a large cast-iron skillet or other large heavy pot. This is the type of cooking and meat thermometer that I prefer and use in my cooking. I get many readers asking what cooking/meat thermometer that I prefer and use in my cooking, baking, and deep frying. I, personally, use the Thermapen Thermometer shown in the photo on the right. To learn more about this excellent thermometer and to also purchase one (if you desire), just click on the underlined: Thermapen Thermometer. Take the formed dough and gently place it into the oil, being careful not to splatter the hot oil. Press down on the dough as it fries so the top is submersed into the hot oil. Fry until brown, and then flip to fry the other side. Each side will take approximately 3 to 4 minutes to cook. Place the cooked Fry Bread on a paper towel to absorb excess oil. Indian Fry Bread can be kept warm in a 200 degree F. oven for up to 1 hour. They refrigerate well and can be reheated in a 350 degree F. oven for 10 to 15 minutes before serving. Indian Tacos are the universal modern PowPow Food (see below). They are also popular attractions at many fairs, festivals, and outdoor summer shows held in the southwest. People will line up to wait their turn to buy some freshly made tacos. 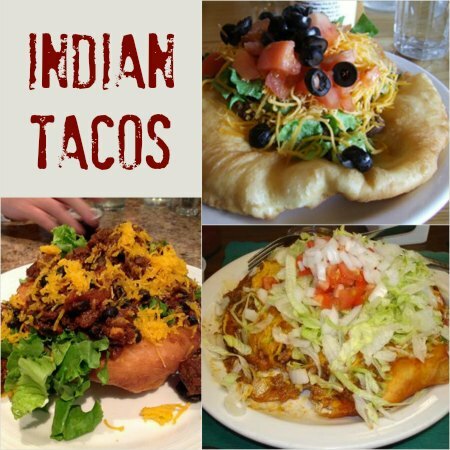 Indian Tacos are a combination of beans or ground beef, chopped lettuce, sliced tomato, shredded cheddar cheese, and optional green chile atop plate-sized rounds of crispy Navajo or Indian Fry Bread. No plates or silverware are needed, as you just fill the fry bread with your desired filling, roll it up and eat. Place Fry Bread, cupped side up, on separate plates. Layer ground meat, lettuce, tomatoes, Cheddar cheese, and green chile peppers onto top of each Fry Bread. Top with sour cream, if desired, and either roll up or serve open-faced with a fork. Every weekend from April through October, thousands of Native Americans throughout the United States and Canada pack up their cars and heat to powwows. Some families go "on the circuit" to many large Powwows which are held at different places every weekend. A traditional powwow is a social gathering of Native Americans from many nations. 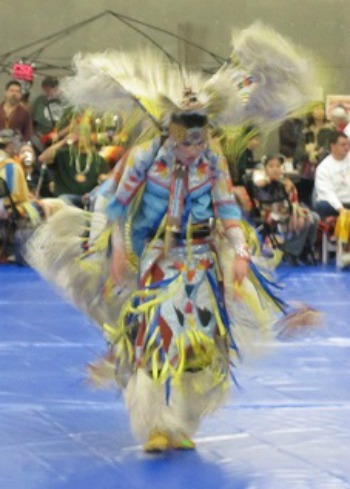 Powwows help maintain cultural identity and attract visiting dancers from all over. In the late 1800's and early 1900's, Indians were not allowed to have dances. Government officials thought the dances were organized to resist federal forces. They did not realize that the dances were held only to honor their elders and warriors, give gifts and recognition to those deserving, sing honor songs, ask questions of the elders, teach by example, dance the sacred circle, and be healed. In the 1960's, officials finally realized that these dances and traditions were not dangerous, only important to Native Americans. Native Americans today are developing deep pride in their culture and traditions. You can also leave out the powdered milk . Navajo fry bread is usually best made with Bluebird Flour. Most Navajos prefer to sprinkle only salt on their frybread and also an onion sandwich made with fry bread is very filling. I have to try this because one of my favorite things on the planet is raw onion sandwiches. My entire family thinks I’m strange but I love them. With the fry bread I bet they’ll be even better. I like to carmelize the onions for the children. Of course peanut butter holds the onions on. Sounds awful but tastes sweet. Am listening to a JA Jance book with a new character (new to me). In the book the tribe cooks “popovers” and “indian tacos”……are popovers the same thing as fry bread? Yes, popovers are what they were called when I was growing up in Tucson in the 1970s on the Tohono O’otam (formerly Papago) Reservation to the west of Tucson. I didn’t hear about fry bread until coming to northern Arizona. Same delicious food. If you visit Tucson, you can buy fry bread or popovers at San Xavier Mission at the outdoor market on weekends. They have the best Indian Fry Bread at San Xavier Mission, it would be a shame to not visit that beautiful “Dove of the Desert” in Tucson AZ. and to miss the delicious fry bread tacos and dessert fry bread made the authentic way by a real Native American. Love Indian fry bread n tacos, can put pie fillings in fry bread too for dessert. My grandma makes Indian tacos and my first time trying it. I was wanting more because it was so good and now I can share it with my fiance, our daughter, and our family. I am happy and thank you and I am not going to add the milk. what about the thickness of the pressed Taco? Yummy – can’t beat making this at home. Thanks for sharing. In 1993 I lived in Ogden, Utah and met a sweet, young traditional Navajo couple. Their first baby was only about a week old in a straight board papoose. She said he would remain in it until he was a year and would be healthy with a strong straight back. It made perfect sense to me as I suffer from congenital scoliosis. He’d not been named yet they were waiting or his umbilical cord to drop off while on a trip to the Reservation at 4 Corners Nation’s. My memory is a bit sketchy but his name and what his life and future job would focus around wherever it fell off. When they got home she told me the all the were on a horse back ride where it dropped off. Now that’s quite spiritual. She used to bead ratings also. My comment/question is… She taught me to make fry bread over open fire not in grease. On the gas stove with a silver grate laid over top of a a brick on either side of the flame. She told me the recipe was so easy to remember cuz I just have to remember 2’s. I can’t remember to save my soul and I lost contact with her I sadly regret. Her name was Nadine. Husband? I don’t remember. But if it was 2’s… 2 full cups flour, 2tsp baking powder, 2 tsp salt? 2 cups milk? Maybe she might have measuredout that much milk just in case or added flour to the rolling surface which I can’t actually remember her rolling, more like tossing back and forth like Pizza pies. What is the Navajo word for fry bread? Cool story Lynda..Above all others, I would try your yummy version of Indian fry bread. If one is in a hurry, you can roll out a canned biscuit and fry it in oil. I make Indian Tacos this way a lot. Sounds yummy but also greasy. Has anyone tried the recipe and baked it? It is NOT greasy if you use enough oil and it is up to temperature before you start. You can boil dumplings without them being soggy from being cooked in water. Likewise you can deep fry foods with out them being greasy just because they were cooked in oil. I would not recommend baking. It is called Fry Bread for a reason. Baking is just “bread”. It would be like baking a donut. Not the same. Rebekah Jones really?? Why do you feel like you have to change the tradition fry bread… Dude if it’s too greasy for your tastebuds don’t make it but don’t try and change a recipe that is part of their tradition.. If you want baked bread just go ahead and eat regular Bread it is baked in an oven, no need to try ” baked fry bread” it doesn’t even make sense 😂 it’s in the freaking name. I have lived in South Dakota for a time and worked with the young Dakota Sioux youth. Anyway, I was a houseparent and one of the young ladies I worked with made Indian tacos. Then a friend took me to the Bad Lands and I was in love! Not with my friend! But with the Indian Tacos! Anyway, I’ve been having a taste for them lately and this looks like a great recipe. I’ll have to try this recipe soon. Thank you for it and the history behind them. i am hoping to serve Indian Fry Bread tacos for our Bookclub , (We ready One Thousand White Women). My question is can I make the bread ahead of time?? Indian Fry bread is best when first cooked. Do not make the fry bread ahead of time as the oil from frying settles into the bread and it turns tough…it would be better if you at least made the dough and cooked them at the last minute. Thanks for the history, how to and recipe! I love good fry bread and now can make my own with organic flour. Thank you for this recipe and history! I grew up in Arizona and started making Indian Fry Bread for my family when I was 9, after having it at a Navajo event. I wanted to make it for my family and knew I’d find a recipe by doing a Google search and found your history and recipe. Very interesting and meaningful. Thanks again! While my children were visiting their father and step-mother (who was full blooded Indian) she had made us a dinner of “Indian Tacos” which in turn my children LOVE today! and of course request them for their birthday dinners and with the WHOLE family, (which after having five children , their spouses and multiplying grandchildren and my 5 siblings and their extended families adds up to a LARGE group). .. I have come to purchasing frozen yeast dinner rolls… after they have risen they are perfect sized to shape and fry making it quicker and easier to make multiples quickly…. In our family, these fried yeast breads are called “bunny cakes.” Have no idea why, except we used to have them on Easter Sunday, or any time the extended family got together. Perhaps it is a German thing as my Grandmother was from Pennsylvania Dutch country. It was breakfast food, like pancakes, with butter and cinnamon or syrup. We have had Navajo Fry Bread and it is quite different. I also had them made (on bread baking day) made with yeast bread dough. I’m also of German origin, they were called Brod Kegla (sp?). Us kyds called them “Broad Casters” as we couldn’t say it right and my Norweign husbands family called them Tista Lumpas. We served them with butter and syrup for breakfast with sausage, or with homemade bean soup. No matter what you call them, they are filling and good. I never knew Indian tacos were a thing until my friend sent me this post. What an awesome idea. I’m definitely going to make these for dinner next week. I am Navajo and grew up on Navajo bread. I make it quite often for family members. Love it. I learned to make frybread in 1960 when living at Navajo Mtn trading post. Have shared the recipe with many friends and family. My instructions were to knead the dough extensively to make it more tender. Can this be baked and not fried? It wouldn’t be the same at all. You’d be better off going with a flatbread like pita cooked on a griddle if you want less oil. 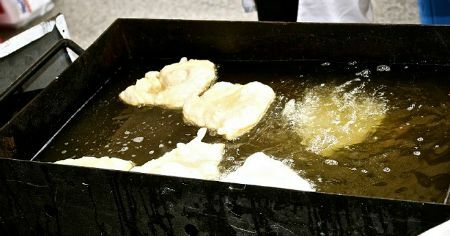 The frying is pretty essential to it being fry-bread. I had no idea about Navajo fry bread and Indian tacos. Is it the very popular recipe in India? I love Indian recipe. I have a colleague from India. Sometimes he gave Indian food when we eating lunch. I will try it at my home and want to surprise my colleague. Thanks for sharing this recipe. I am an American/Puerto Rican and grew up fairly poor just like the rest of America back in the day. My mother and hunger sister made these but we called them Jonni cleats/aka Johnny cakes In St. Thomas and other Islands that’s what they are called. So thank you for taking me down memory lane and the recipe love it!! Sounds about like the flap jacks we use to cook in the south. Recipe is the same, except we cooked ours like pancakes. I didn’t know what pancakes were until later in my childhood. This inspires me alot. Looks yummy and cool. Thanks for your sharing the great recipe. My mouth cannot stop watering. I love these. Grew up in ND and my German family made these all the time. The German name Brotkeachla translates roughly to little fried breads. We ate them warm, slathered with butter. Nothing better in this world. I always thought they were a German food, but probably just common on the early Great Plains and adopted by many cultures. I tried this recipe and it came out good. I made small size 4 inch in diameter. Thank you for sharing. 01/03/2019. I am grateful that you shared the history of this dish. From your article, it seems that is was born out of scarcity and displacement with limited resources, a testament to the resilience and creativity of the people. I gave this recipe a try two nights ago and just had to come back and say the family loved it. This is definitely on our make again list.